Admittedly, I was disappointed that Lando Calrissian, our favorite smooth-talking “galactic entrepreneur,” was left out of The Force Awakens. While arguments in defense of his absence have typically revolved around that fact that he was not an “original” character in the Original Trilogy, I have consistently felt that this argument is flawed. True, Lando was not in A New Hope and was only introduced at the outset of the Third Act in The Empire Strikes Back. But from his first appearance as Baron Administrator of Cloud City and onward, Lando Calrissian (portrayed by Billy Dee Williams) was elevated to “origial character” status, playing a critical role in the major events which unfold in the remainder of Original Trilogy. This being the case, it’s especially important to remember (as if one could really forget) that Lando not only commanded the Rebel Starfighter squadrons during The Battle of Endor, but that he also flew the Millennium Falcon into the superstructure of the Second Death Star and (with the help of X-Wing pilot Wedge Antilles) destroyed the battle station. So sure, Lando wasn’t an “original” Original Trilogy character, but his actions – culminating in his heroics in Return of the Jedi – absolutely established him as a character equal in importance and stature with R2-D2, C-3PO, Princess Leia, Luke Skywalker, Chewbacca, and Han Solo. The iconic last scene in Return of the Jedi, which includes each of these heroes, as well as Lando, is visual proof of this obvious fact (see the featured image above). Further, the “not an original character” argument also falls short because Admiral Ackbar and Nien Nunb, both secondary characters introduced in Return of the Jedi, were in The Force Awakens. While it is pretty damn awesome that Ackbar and Nunb are in the film, it is none-the-less perplexing that Lando was left out while they were not. In fact, this is even more perplexing when one remembers (again, not that one could forget) that Nien Nunb was Lando’s co-pilot during The Battle of Endor. His co-pilot!!! Lando and Nien Nunb in the cockpit of the Millennium Falcon. Now, in stating, albeit briefly, why I think this particular argument for Lando’s absence is flawed, I also have to acknowledge that after watching The Force Awakens, I don’t really think Lando could have fit into the movie all that easily. It is certainly conceivable, for example, that he would be hanging out at Maz Kanata’s Castle on Takodana, but had he been there when Han, Finn, and Rey enter, his presence would have taken away from our introduction to Maz Kanata. And, had he been a member of the Resistance high command on D’Qar, his presence may have felt much more like a basic cameo, just one voice among many offering insight into the battle against the First Order. Besides, with Episode VII in the books, we must now look toward Episode VIII and IX for Calrissian to make another glorious onscreen appearance. And, even though the IMDB page for Episode VIII does not list Billy Dee Williams as part of the cast, I can certainly imagine a scenario in which Lando’s inclusion hidden until the last possible moment. In fact, I would be quite pleased to go into the film unsure if Calrissian was to appear, only to find out he IS in the movie. Granted, there is the possibility that Lando will not be in Episode VIII (or even IX), and if this is the case my disappointment is gonna quickly morph into outright anger…and I have a feeling I won’t be the only Star Wars fan feeling that anger. A few weeks ago while watching Return of the Jedi, I was struck by a particular scene. In fact not a scene per se but a small section of a scene that lasts for just over ten seconds in total. It occurs in the middle of the film just after Luke Skywalker contemplates his father (now Darth Vader, formerly Anakin Skywalker) and pronounces, “then my father is truly dead“. Luke is led away by Imperial Stormtroopers and as the doors shut one senses a distinct lapse in Vader’s demeanour as he places his black gloved hand on a steel girder in the corridor where the scene takes place. Although Vader is masked, one is left with little doubt as to the turmoil boiling within him which his son has sensed only moments before being escorted away. Captured, Luke stands before his father. This is a scene that I am extremely familiar with and it’s no exaggeration to say that I have viewed it hundreds of times at this point. Many of you reading this will be in the same position. An interesting point of note however, is that as time progresses in Lucasfilm’s new canon, layer upon layer of light and shade is gradually being cast onto erstwhile familiar scenes. What made this particular scene reverberate once again for me was both the advent of a sequel within the cinematic saga – namely, The Force Awakens, and the work on Anakin/Vader’s back story that we are now aware of from the new canon (the novel Lords of the Sith, and television series The Clone Wars and Star Wars Rebels). Now I’m no neuroscientist, but I’m in no doubt that some neural connection (figuratively or otherwise) fired within me during my recent viewing of this “Vader scene” in Return of the Jedi. I think that having been shown evil and vulnerability co-existing so obviously on screen in the character of Kylo Ren, I may now have increased sensitivity towards those traits within Vader. One can’t help but note the incongruity of Kylo Ren seeking strength in Vader’s artifact (his Mask), when Return of the Jedi shows us, particularly in its last scenes, that Vader himself obviously harbored tensions between internal light and shade. Indeed, those tensions within Vader would have occurred not just in that scene but presumably at other points that George Lucas did not show us. Our insight into Kylo Ren has shown us that witnessing a character purveying violence and atrocities, does not mean that they aren’t conflicted. We know that Ren seeks strength from his Sith relics, erroneously viewing Vader as a pillar of pure, un-tempered dark power. Kylo Ren sits with and speaks to his most precious artifact – the mask of Darth Vader. Ironically it is actually Ren’s insecurities that heighten his ability to strike fear in the viewer. Vader’s representation of ultimate martial strength may have been underpinned by the portrayal Lucas chose to focus upon in episodes III, IV, V and VI. Importantly though Lucas also spoke of the need to use Vader sparingly so as not to dilute his impact on the viewer. Consider for a moment your perception if all you had seen of Kylo Ren was the Battle of Jakku, the interrogation of Poe Daemeron, and the killing of his father Han Solo. You would in all likelihood take the view that Ren demonstrated darkness and nihilism on par with Vader. As it is, due to the different approach to character portrayal within Episode VII, we have been given an insight with a wider focus as plot device. In turn that insight sends us back to what we have seen before and makes us wonder if the same kind of internal conflict occurred in Vader’s early years, only to be buried deep before ultimately being released by his son Luke in advance of his final hours at Endor. In The Force Awakens itself we see Kylo Ren, formerly Ben Solo, also struggle with a pull towards the light, the draw of his family, and the effects of surprise dissent and challenge. Vader’s struggle, although less obvious, is sensed by Luke and is driven by his son’s appeal to the traces of the Anakin Skywalker that his father once was. What adds a further dimension to the scene in question from Return of the Jedi, and shades of gray to Vader’s portrayal in the overall saga, is the fact that we now know so much more about Anakin than we once did. It’s worth noting in this context that I write this article after the broadcast one of the most heart-rending moments in the Star Wars canon, the confrontation between Vader and his former Padwan learner Ahsoka Tano. Forged in The Clone Wars series, their relationship as Anakin and Ahsoka reached its cessation (for the time being) in the Rebels Season 2 Finale, “Twilight of the Apprentice.” Like the scenes within that finale, this scene in Return of the Jedi is rendered so powerful through a contextual knowledge of the Star Wars saga. We now watch such scenes while projecting both forwards and backwards in our Star Wars knowledge. This isn’t compulsory for viewer enjoyment, but it will significantly enhance it. Ahsoka Tano receives a Force vision that reveals the truth – her former master, Anakin Skywalker, is Darth Vader. Unlike a viewer of the Return of the Jedi scene in 1983 we are now aware of a cinematic portrayal of Anakin Skywalker, the innocent young boy from Tatooine, and his desire to assist the stranded Qui-Gon Jinn and Padmé, we are aware of his later awkwardness as a teenager, and his ultimate seduction by Palpatine towards the ways of the Sith immediately in advance of Mustafar. We know of the Shakespearean tragedy of Anakin’s fall in Episode III Revenge of the Sith, and his becoming the symbol of terror known as Darth Vader. Likewise, we know that those events occurred due to a desire to save and preserve family, and in some respects as a response to loss of family, both his mother Simi and his wife Padmé, and his unborn child (in fact his unborn twins although he didn’t know this). The scene begins with an exchange where Luke acknowledges his father and Vader notes his acceptance of the familial relationships. Luke qualifies this however. His first move in this meeting of minds is to state “I have accepted the truth that you were once Anakin Skywalker…”. Note how quickly Vader interjects, instantly snapping that, “that name no longer has any meaning for me!”. The reaction of Vader is instinctive; Luke has sparked a reflex triggered by Vader’s most private of ruminations. Luke persists however stating that, “It is the name of your true self you have only forgotten” and concludes “that’s why you won’t bring me to your Emperor now.” Watch Vader closely in the background behind Luke. He marginally but notably withdraws. Crucially there is no sense of aggression or loss of control. Instead Vader’s eyes, or at least his direction of vision indicated by the direction of his Mask, turns towards Luke’s new lightsaber. One senses an indication of remorse, regret, or contemplation. The crisp ‘snap-hiss’ of the lightsaber igniting then throws us, and immediately breaks any sense the viewer has that Vader doubts his position in any way. The noise, one of the many unique sounds in the Star Wars universe, snaps the viewer back into focus on the peril Luke is facing. Vader says to Luke “your skills are complete – indeed you are powerful as the Emperor has foreseen.” In doing so he brings the conversation back to Luke as the focus. Luke in turn again attempts to persuade and this time we start to anticipate a much more noticeable thaw within Vader. Crucially we are given our first verbal indication of the doubt conveyed earlier only by discrete body language. Vader speaks to Luke and states “Obi Wan once thought as you did…”and the soundtrack theme softens. The viewer is now thinking of the brothers in arms that Anakin and Obi Wan once were. Luke tries to persuade but Vader eventually concedes, “it is too late for me Son“. There is a marked sincerity in Vader’s voice and as he utters the words “The Emperor will show you the true meaning of the Force – he is your master now” one is left wondering if the warped mind of what once was Anakin Skywalker now actually believes that Palpatine will do the best for his son, and the best for the galaxy. Then comes the highlight of the scene. Luke responds with the words “then my father is truly dead.” Luke’s tone highlights his disappointment but also his courage given what lies in wait for him. It shows the strength of Luke that he is not cowed in this situation. He is confident that his path lies in his Jedi teaching, and his compassion towards his father. Vader tracks Luke’s withdrawal with the Stormtroopers and this to me is critical. At 3:19 on the video, watch Vader and wonder what is going on behind that Mask, knowing as we now do that Luke was right. What are the thought processes that occur? The door of the elevation capsule closes, and Vader turns and looks out the window of the corridor, there are almost ten seconds that pass while the viewer listens to Vader’s mechanical breathing apparatus and looks into the depths of his blank stare. Projecting forward, and as noted above, we are at the time of writing exploring the legacy of this scene and the events immediately thereafter. The Knights of Ren in the new sequel era have a false understanding of both this event and those immediately surrounding it. They view Vader as a quasi-Divine figure. We are not quite sure of their relationship with the Sith at this point. What is certain, however, is that Ren seeks strength from the ultimate in Vader artifacts, his Mask, indeed literally Vader’s death Mask. Ren seeks strength to overcome the same emotions that trouble Vader in the scene we are contemplating, and then tragically uses the inspiration obtained from that relic to do what Luke refuses to do: kill his own father, Han Solo. The reason that I now view this section of Return of the Jedi as one of the critical scenes in the saga is because from it we see the linkages that span from the opening scenes in The Phantom Menace and trace the repercussions those events still have around 70 years later. We see how Luke’s relationship with his father is having a direct effect in the sequel era on a misguided Ren’s relationship with his own father. We see the death of one of the saga’s most beloved characters and the hero of the New Republic slaughtered because of a false impression of strength that has cascaded from the myth of the grandfather to the reality of the grandson. We see Luke’s beliefs and Luke’s obvious failure to impart his own beliefs, and their wisdom, to his nephew who has become corrupted. This is what is beautiful about these films and why the latest developments in the saga and new canon have enriched and embellished films that we have known and loved for nearly 40 years. With the developments in the beautiful animation found in The Clone Wars and now in Rebels, and the love and passion brought to such works by people like Dave Filoni, we can probably look forward to another 40 years of thoughtful and inspired mythology. Writer’s note: I know that others will have different takes on these cinematic events and portrayals. As always this is part of the enjoyment of these films and I look forward to exchanges with fellow fans on these issues. Find me on Twitter @PartisanCantina and check out my site (Partisan Cantina). So, What’s Luke Been Up To? In the months leading up to the release of The Force Awakens, one of the most prominent questions on everyone’s mind was – Where is Luke Skywalker? He wasn’t in any of the trailers. He was shockingly absent from the poster. We only heard his voice, narrating a slightly altered version of what he tells Leia about his family and the Force in Return Of The Jedi. Speculation was rampant. And there were even those (apparently the ones who’d never watched Star Wars or totally missed the point of the whole narrative) who were insistent that Luke had fallen to the Dark Side and perhaps was even Kylo Ren. Now, all those questions have been cleared up. But the most important question for me still remains. And I hope I get an answer worthy of the mythic hero of Star Wars. The answer to this question is important because, to put it simply, Luke is important. Luke Skywalker is the hero of Star Wars. Yes, it’s Anakin’s story but Luke is the force (no pun intended) of redemption that allows Vader to do what must be done. If Anakin is the savior, Luke is the redeemer. And both of them are necessary to bring balance to the Force. So we know where Luke was at the end of Return Of The Jedi – happily celebrating a major victory with his family and friends, while the redeemed Force ghost of his father looks on with Obi-Wan and Yoda. And we know where Luke is at the end of The Force Awakens – doing his mystic hermit thing on a not-so-easily-accessed lake front property in utter isolation. Even R2 was left behind. His hand hasn’t been cared for (presumably), leaving the synthiflesh to rot away and expose the metallic hand underneath. Celebration taking place behind him, Luke looks off towards the Force ghosts of Obi-Wan Kenobi, Yoda, and his father. The question I need answered (the question I am so, so scared won’t be answered with the clarity and detail it absolutely needs) is what has Luke been doing in the thirty years since the Battle of Endor?? One of the major faults I have found with the Disney Canon is that (with few exceptions) it gives us no real worthwhile details. It’s all painted in broad strokes. We are left struggling to fill in almost as many gaps during those thirty years as we had before The Force Awakens was released. Disney seems to perpetually tell stories set between A New Hope and The Empire Strikes Back, stories (more often than not in my opinion) having little to no significant impact on the saga, while ignoring the gaping holes in the timeline Star Wars fans want to know about. The major exception to this rule would be Claudia Gray’s beautiful and brilliant new novel, Star Wars: Bloodline. This was the first novel I’ve encountered since Disney took over that gave me the thrill I almost always found with the old EU. It gave a detailed look at the Star Wars galaxy. It expanded on what was in the films in a way that made logical sense. And the expansions were helpful and felt necessary. Also, she gave us both a picture of Leia that was organic and dynamic as well as new characters who were exciting and seemed to naturally fit in the Star Wars universe. Ransolm Casterfo is the first new character I’ve found in the Disney Canon who seemed as complex and integral to the Star Wars universe as characters like Pellaeon, Natasi Daala, and Talon Karde did the first time I met them. The novel also left us with some MAJOR question marks in regard to Luke Skywalker. (If you haven’t read Bloodline yet, this paragraph and the next contains minor spoilers about moments Luke is mentioned in passing in the novel but doesn’t address anything that’s central to the plot of the book.) You see, Bloodline is set six years before The Force Awakens. Granted, we only get glimpses of what Luke’s been up to since Return Of The Jedi. But it doesn’t seem like he’s been doing much. He and Ben Solo are bouncing around the galaxy doing…something. The cover of Star Wars: Bloodline. A discussion in the Senate sees Lady Carise Sindian remark, “Princess Leia spoke of her brother, the famous Luke Skywalker, who has been little seen in the public sphere for many years now.” Then Tai-Lin Garr replies, “Since the Rebellion, Skywalker has lived a private life. He has asked no more of the New Republic than any of its other citizens, nor have we just cause to ask any more of him than the substantial service he has already given.” So the last of the Jedi decided to…retire? He’s road tripping with his nephew? Whaaaat?? Judging from the little information the new Disney Canon has provided us, Luke is apparently completely disconnected from the New Republic and almost entirely cutoff from his family. We can infer then IN THE PRECEEDING TWENTY-FOUR YEARS he didn’t rebuild the Jedi Order. So, I ask again, what was he doing? The final conversation Luke has with Yoda before his death on Dagobah makes this even more confusing. As Yoda lays down for the last time he tells Luke, “Twilight is upon me and soon night must fall. That is the way of things, the way of the Force.” His final words to Luke are, “Luke…when gone am I, the last of the Jedi will you be. Luke…the Force runs strong in your family. Pass on what you have learned. Luke…there is…another…Skywalker.” The literal final instruction Yoda – the Jedi Master that Kenobi told Luke to find to complete his training – gave Luke was to pass on what he had learned. And the Disney Canon wants us to accept that Luke’s response was, “Nah.” I don’t buy it. It doesn’t make any sense. Luke wanted to follow in his father’s footsteps. He spends much of the Original Trilogy trying to become a Jedi Knight like his father. In A New Hope, Obi-Wan taught Luke, “The Jedi Knights were the guardians of peace and justice in the galaxy before the dark times, before the Empire.” So he knows that the Jedi were an order who protected people during the Old Republic before Vader and the Emperor wiped them out. He finds Yoda, completes his training, is instructed to pass on what he’d learned, and THEN DOES NOTHING FOR OVER TWENTY YEARS. Why?? Again, it makes no sense and a legitimate answer must be given. This story must be told and it must be told with a depth and intimacy to rival Claudia Gray’s depiction of Leia in Bloodline. A few lines of exposition (and maybe a few flashbacks) in Episode VIII aren’t going to cut it for me. Luke Skywalker is too important a character for that! We need to understand why he turns his back on everything he was, everything he did, and everything he was instructed to do. The cover of Jedi Search, first book in The Jedi Academy Trilogy. As I watched Yoda’s death scene in Return Of The Jedi a few more times, I wondered if perhaps Disney wanted us to buy that Yoda told Luke to pass on what he learned to his family alone. You could make the argument, from the phrasing, that Luke could have interpreted it that way. But we know this isn’t the case. In The Force Awakens, Han tells Rey and Finn that Luke was bringing up a new group of Jedi when Kylo Ren cut the order apart and Luke took off. We know that there can’t be that many Skywalkers around. So, in the six years between Bloodline and The Force Awakens, he was (finally!) training new Jedi. But the question remains, why did he wait? What was he doing?? In the Expanded Universe, Luke spent much of his time after the Battle of Endor learning everything he could about the Jedi to rebuild the Order. By seven years after Endor (in Kevin J. Anderson’s “The Jedi Academy Trilogy”) Luke was taking his first tentative steps in recruiting new Jedi and training them on Yavin 4. Yes there were problems. There were ups and downs. But Luke was passing on what he had learned and trying to restore the Jedi to the galaxy. Why isn’t he doing that in the Disney Canon? Why isn’t he advising the New Republic in any role? What could possibly be going on that’s more important than all of this? All Luke Skywalker, last of the Jedi, does post Return Of The Jedi in the Disney Canon is…fight for shrubbery?? In the (weirdly lackluster) conclusion to Shattered Empire, our first new canon look at life post-Endor, we see Luke Skywalker and Lieutenant Shara Bey infiltrate the highly secure Imperial base on Vetine…to save two trees. They’re important I guess? Luke says of the trees, “These are all that remain of the tree that grew in the heart of the Jedi Temple on Coruscant. The Force is with them.” And they are clearly important enough for Luke to risk his and Shara’s lives by invading this facility three months after the Battle of Endor. But they’re also important enough for Luke to just randomly and spontaneously give one away to Shara so she could plant it in her family garden?? What? So Luke redeems his father, fights for a shrub (a shrub we never hear about again), and then does absolutely nothing. Luke, stands before the remains of the Tree that grew in the Jedi Temple. We’re supposed to believe that the man who destroyed the first Death Star, who became the last Jedi Knight, who learned from Yoda, who redeemed Anakin Skywalker so balance could be restored to the Force just walked away? He did nothing. For over twenty years. He was just sitting around…waiting? Why? WHY? The cynic in me believes it’s because Lawrence Kasdan remains pissy that Lucas didn’t use the darker ending he wanted for Return Of The Jedi. As is well documented, Kasdan wanted Han Solo dead and Luke, so broken by his ordeal, to fade into the mist like Shane at the end of the famous Western of the same name. Lucas didn’t go that route (in part, I’d argue because he understands the purpose of myth and what lesson Star Wars was supposed to be teaching us) and Kasdan has been open about his displeasure with it. Well now The Force Awakens rolls around and look what happens! With Kasdan helping with the writing duties Han Solo dies (admittedly, in a powerful moment that I feel served the character and the story well) and Luke Skywalker has disappeared only to be found out in the wilderness alone, not unlike a wounded gunslinger haunted by what he’s had to do (something that doesn’t fit his character or the tone of the end of Return Of The Jedi at all). Cynicism aside, this is still a MAJOR question that needs an appropriate answer. There’s no logical reason Luke Skywalker hasn’t been active in the galaxy since the Battle of Endor. And every instance he’s shown up in the Disney Canon has only served to make his absence and apparent apathy more confusing. So, when the time comes, I hope we get a story that honors who Luke Skywalker is. The relevant question for Episode VIII is no longer Where is Luke Skywalker? but rather What has Luke Skywalker been doing for THIRTY YEARS that is more important than rebuilding the Jedi? The answer, whenever Disney decides to give it to us, better be damn good. Luke Skywalker as a mythic hero, and we as Star Wars fans, deserve nothing less. Since it was released in September 2015, Star Wars: Uprising hasn’t really garnered a great deal of attention, and when it has, the attention hasn’t always been positive. In large part, this is because the mobile game – which takes place in the Outer Rim’s Anoat sector and is set in the months following the Battle of Endor – is a real slog, taking the player on a lengthy journey of level-ups, gear/crew upgrades, sector battles, and story missions that seem to drag out. In other words, it takes a persistent amount of dedication and patience to stay committed to Uprising, especially if one wants to soak up all that it adds to the Star Wars mythos. Well, long story short, I am one of those persistent people. I was ready to play Uprising before it launched, and since then, I have consistently played it. I have, in fairness, taken some breaks every now and again, but I nevertheless continue to go back to it. I have always loved Star Wars RPG games, in large part because these games offer a “direct experience” of the universe. Sure, Uprising might not be the most popular of games, but it is a game that I enjoy because it offers a unique take on Star Wars, the immersion in the history and present-day happenings of a sector in the Star Wars galaxy. No, it isn’t the most action-packed of Star Wars games ever made, but approach it with an open-mind and one will quickly discover that there is a lot to glean from it about Star Wars lore. So what does Uprising have to do with Hutt Week? Well, read on and you will find out it has EVERYTHING to do with Hutt Week. Rancor skulls staked beneath fraying banners. Originally introduced in The Essential Atlas – one of the MANY Expanded Universe reference guides – Mataou is a planet that C-3PO would certainly describe as a “desolate place.” A hot desert world sitting on the edge of the Ivax Nebula, Mataou serves as one of the entry points into the Ison Trade Corridor, a hyperspace route that branches off of the Corellian Trade Spine. Best known for the native and highly venomous Ro Hypa serpent, Mataou is also notorious for its former rulers: the Hutts. In those missions in Uprising where one travels to Mataou, what one comes across are the ruins of a once grand Hutt presence. While some of these ruins have been restored thanks to criminal elements that utilize Mataou as a hideout, the structures on the planet are otherwise in disuse and show clear signs of crumbling and decay. Nevertheless, the classic architecture and massive complexes point backwards in history to a time when the Hutts dominated the planet. Of particular note on Mataou are statues of various Hutts – perhaps those who belonged to the Gnuda Kajidic (family/crime gang) – a visual reminder of the influence and power the Hutts maintained over those they ruled. Draped from the sides of the impressive buildings are tattered banners, the script written on them being a form of Huttese that also appeared in The Clone Wars episode “Bound for Rescue.” In turn, scattered among the abandoned, sand-swept ruins one also comes upon the occasional bleached skulls of dead Rancors, a clear indication that Jabba was not the only Hutt to have an affinity for the massive beasts. Additionally, there are chains and shackles attached to walls, and one has to wonder if slaves and/or enemies were fed to Rancors, Ro Hypa, or other deadly creatures. As well, the wreckage of desert skiffs, similar to the ones we see in Return of the Jedi, can also be found strewn about the Hutt complexes. The most intriguing vestige of these Hutts, at least in my opinion, is a spot known as the Shrine of Dynasties. With an altar at its center, thriving plant life, and an ambiance radiating tranquility, the Shrine has an obvious sacred and religious feel to it. In fact, I would not be surprised to learn that the Shrine is a conduit for the Living Force. Historically, the Shrine of Dynasties was used as a meeting place between the Hutts and the Nothoiin Noble Court. The Nobles, you learn in the game, are the long-time and rightful rulers of the Anoat sector. At the Shrine, the two sides would discuss matters of peace and cooperation. Unfortunately, this is all we learn about not only the Shrine of Dynasties but the relationship between the Hutts and Nobles. Still, this little information is enough to make me want to know more about their relationship. It’s hard to imagine any Hutts being cooperative or peaceful, but clearly the Hutts who governed Mataou were willing to be both with the Noble Court. My character stands before the altar in the center of the Shrine of Dynasties. Then again, even if they were peaceful and cooperative with the Nothoiion nobles, this hardly means they always acted/negotiated with righteous intentions. After all, we are talking about Hutts, a species best known for profiting off of illegal activities. It would not be surprising if we eventually learn their peace and cooperation was motivated by the desire to avoid the scrutiny of the Nobles. Better to play along so the Nothoiion do not suspect the Hutts are up to no good, right? Ultimately, it’s hard to say for sure exactly what the Hutts of Mataou were like beyond what little information we can piece together in the game. Perhaps they actually WERE a planet of Hutts that broke the mold, acting altruistically and for the benefit of all. Or, maybe they were like other Hutt clans, entirely concerned with their own self-interests and preservation. There is no way of knowing for sure until more information about these Hutts is added to Uprising specifically, or the Star Wars canon in general. And if that is to happen, if we do end up getting more details about these Hutts – their relationship with the Nobles, their opulent lifestyle, their connection with other Hutt worlds, etc. – I also hope we are eventually told why their civilization on Mataou crumbled. This is probably the single biggest question I have about the Hutts of Mataou, a curiosity to know what became of them and why they no longer inhabit the world. In Uprising, a character named Riley mentions that the Hutts might have left the planet because of the Ro Hypa, and perhaps this was so. Otherwise, maybe there had been infighting, or a war with outsiders, or a disease that wiped out the population. Or perhaps, in what would be typical Hutt fashion, living on Mataou stopped being good for profits and they moved to another world. The possibilities are limitless and open to the imagination. Still, I should note that there is at least one Hutt who continues to live in the Anoat sector, one whose ancestors hailed from the desert world: Voras the Hutt, leader of the Ivax Syndicate. A mysterious Hutt with his hands in an endless number of criminal activities, Voras and his Syndicate hold incredible influence in the Anoat sector. But that is all I will say about them…I don’t need Voras putting a bounty on my head. I hope you enjoy these Hutt Haiku Poems created by fans of Star Wars/The Imperial Talker and by yours truly! Feel free to email your own Hutt-related haiku if you would like to add to the page! …from where do you poo? Eat eat eat those frogs. Getting yourself shot like that! He likes haiku, do you too? Who will love that Hutt? cloud that smells of meat? In the lead up to Hutt Week, Jeff (The Imperial Talker) and I were having a discussion about a Hutt-related issue that has always confused me. It’s not directly a Hutt thing but it’s certainly Hutt adjacent. It’s the type of thing I try not to think about, lest it keep me up at night, struggling in vain to find a workable answer. Try as I might, I can’t. The question is simple – Why doesn’t Han just pay Jabba what he owes him? Jeff’s already discussed the Hutt crime organization this week so there’s no need for me to go back over the whole structure when it’s a handy hyperlink away. But here’s the basic rundown of the plot that ties Han Solo to Jabba the Hutt, culminating in the first act of Return Of The Jedi. Han smuggles for Jabba. Han dumps his shipment at the sign of Imperial cruisers. Jabba’s (understandably) a little upset about this. Jabba wants his money…or he wants Han dead. Han (also understandably) would rather not die. So he needs some money. Han Solo – General, I’ve got to leave. I can’t stay anymore. General Rieekan – I’m sorry to hear that. Han Solo – Well, if I don’t pay off Jabba the Hutt, I’m a dead man. General Rieekan – A death mark’s not an easy thing to live with. You’re a good fighter Solo, I hate to lose you. Han Solo – Thank you, General. You don’t mess around with the Hutts, especially Jabba. I get that. But here’s what troubles me…didn’t Han get a reward for saving Leia? Didn’t we see Han and Chewie loading several crates of credits on board the Falcon at the end of A New Hope? Even if Han had given his heart and his soul to the Rebellion (or a certain Princess…), why didn’t he take a short detour to Tatooine to pay off Jabba with the money he had? The Expanded Universe gave us an answer that involved a gambling problem and some Ocean’s Eleven-style high jinks (thank you Timothy Zahn!) but we all know that’s not canon anymore. And even if it was, even if Han lost all the money doing something stupid, if he’s such an asset to the Rebellion why wouldn’t they help him with the debt?? The Rebellion, by the very nature of an organization like this, has to have decent cash reserves. They need to maintain their fleet, bases, equipment, and spy network at the very least. Why wouldn’t they divert a little money to help Han out, especially if it meant they got to keep Han Solo, Chewbacca, and the fastest ship in the fleet? Han didn’t pay Jabba, so Han becomes a wall decoration in Jabba’s palace. Seems fair to me. It should be a very simple equation. Like I said, you don’t mess with Jabba the Hutt or you die. Han has messed with Jabba the Hutt and is going to die. Han does not want to die so he needs money. Han gets money/the Rebellion has monetary reserves. Han uses his/the Rebellion’s money to pay off Jabba, thus appeasing the Hutt and preserving his life. Except it all gets a little wonky… The equation ends up going, Han doesn’t want to die so he needs money. Han (and the Rebellion) just wait around until a bounty hunter grabs him. Then Luke, Leia, Chewie, Lando, and the droids (some of the Rebellion’s most important assets) have to devote a lot of side time trying to rescue Han. Captain Panaka says it best in The Phantom Menance: “the Hutts are gangsters.” Dominating the Star Wars underworld through organized crime, the slug-like Hutts are a force to be reckoned with, their power and wealth coming from a conceivably endless list of illegal activities – slavery, gambling, racing, arms dealing, racketeering and extortion, smuggling, gladiator matches and blood sports, violence, and murder. Controlling large swaths the Outer Rim – from Tatooine and Mataou to the Hutt homeworld of Nal Hutta and it’s moon Nar Shadda – their collective influence seeps into the hidden corners of the galaxy while also making its way to the seats of galactic power in the Old Republic and Galactic Empire. In every imaginable way, the Hutts live up to the moniker “gangster,” their criminal dealings and nefarious presence always lurking in the shadows. And out of all the Hutts in the Star Wars universe, the one who lives up to the term gangster better than all the others is incredibly obvious. It is Marlo the Hutt. You thought I was gonna say Jabba the Hutt, right? Well yeah, of course the answer is Jabba, but I will get to him in a second because Marlo the Hutt is worth discussing. Introduced in Season 3 of The Clone Wars, in the episode “Evil Plans,” Marlo the Hutt was/is a member of the Hutt Council (I’ll discuss the council momentarily). Appearing as a hologram, Marlo is present for a handful of seconds and only listens while other members of the Council discuss important matters. However, at the outset of the very next episode, “Hunt for Ziro,” Marlo appears once again, and this time we do hear from him. Seeing him more clearly, able now to listen to his voice, it becomes very very VERY apparent that Marlo the Hutt was based on Vito Corleone. Vito Corleone, the Don who heads the Corleone crime family in what is undoubtedly one of the greatest (gangster) films of all time – The Godfather. Like Corleone, Marlo has the puffy cheeks, a thin “mustache” created by marks on his upper lip, slick looking “hair,” and a wrinkled forehead. Marlo also speaks with a low, raspy form of Huttese similar to the low, raspy English of Don Corleone in The Godfather. Moreover, Marlo the Hutt – whose name is not mentioned in “Hunt for Ziro” but does appear in the credits – is clearly named in honor of Marlon Brando, the legendary actor who won an Academy Award for his portrayal of Vito Corleone. In turn, the inclusion of Marlo the Hutt in “Evil Plans” and “Hunt for Ziro” is appropriate since these back-to-back episodes of The Clone Wars are where we are first introduced to the aforementioned Hutt Council. This Council, a body comprised of the five Hutts who control the five major Hutt families, governs the collective criminal activities of the entire Hutt Clan, the crime syndicate to which these families belong. Just as Marlo is a nod to Don Corleone, the Hutt Clan is a clear nod to the Five Families in The Godfather (which were themselves based on the real-life Five Families of the Italian American Mafia), while the Hutt Council was obviously based on the Commission, the ruling body consisting of the heads of these Five Families. As someone who absolutely loves The Godfather, I think it is pretty damn cool that the show runners of The Clone Wars chose to make these connections with the iconic film. These connections, at least for me, added a new, dynamic depth to the Hutts, a layer of rich complexity to their criminal enterprise that had not previously existed. That said, for those who have never seen The Godfather, it is at this point that I would encourage you to check it out. Even if one is completely uninterested in all the ways the Hutts are akin to the Five Families or the Corleones, The Godfather is just too damn good not to watch for it’s own sake. That said, whether you have seen the film, need to watch it, or just don’t want to watch it, I need to clarify something before we move on. In short, while Marlo the Hutt was obviously created as an homage to Marlon Brandon’s iconic character, Marlo is not the real Don Corleone of Star Wars. Heck, Marlo isn’t even the leader of the Hutt Council – but I bet you already knew that. The leader of the Hutt Council, the real “godfather” in Star Wars, is the none other than the illustrious Jabba the Hutt, so let’s turn our attention to him. There is something incredibly special about the way Jabba was first introduced in Star Wars – indirectly, through conversation. Han Solo, whom we just met at the Mos Eisley Cantina in A New Hope, gets up to leave and is immediately stopped by the bounty hunter Greedo. Gun in his chest, questioned where he is headed, Han tells Greedo “I was just going to see your boss. Tell Jabba I’ve got his money.” This statement not only sets the tone and trajectory for Han and Greedo’s tense discussion, which leads to the moment Han shoots Greedo, but it also introduces us to Jabba and establishes how we are to think about this new, mysterious figure. Without needing to see him in the flesh, it is apparent this “Jabba” is a powerful criminal boss – one with enough wealth to hire bounty hunters – and that his form of justice is simple: if you cross him, there are repercussions. Just as the real villains in The Godfather are those who betray the Corleone family, those who would betray Jabba are his villains, and Han has clearly done something to make Jabba angry. So what did Han do to cross Jabba? We learn from the conversation that Han dumped a shipment he was smuggling for the crime lord when he ran into an Imperial cruiser. Explaining to Greedo that he had no choice, that “Even I get boarded sometimes,” Greedo responds by saying Han can “tell that to Jabba.” Are we to believe this Jabba would care that Han dumped his shipment before he was boarded? Absolutely not! Solo’s decision to dump the cargo was clearly out of self-preservation, Han looking out for Han. The thing is, Jabba isn’t concerned about Han or his safety, Jabba is only concerned with his own self-interests, and since that cargo belonged to the gangster, Han must pay the consequences for his betrayal. And as we know, Han does “pay” when he ends up frozen in carbonite and used as Jabba’s favorite decoration in the Hutt’s palace on Tatooine. A cruel punishment, but under the auspices of Hutt justice, an entirely fair one. Han Solo, frozen in carbonite, hands on the wall in Jabba’s Palace. Knowing that Han was wanted by a mysterious crime lord was always one of the most compelling aspects of the Original Trilogy, a sub-plot that runs through the first two movies, and finally culminates in the first act of Return of the Jedi. From the very beginning, this sub-plot helped to establish one of the most important backdrops to the Star Wars galaxy: the criminal underworld. From his first mention in A New Hope to his death in Return of the Jedi, Jabba is the very center of this underworld, its heart and soul. Sure, there are a handful of other vile characters in the Original Trilogy- like Ponda Baba and Dr. Evazan who threaten Luke in the Mos Eisley Cantina- but no one on the same level as Jabba. What really stands out about Jabba and his role in establishing the criminal underworld is that we learn next to nothing about his questionable dealings in the Original Trilogy. While we know Han was hired to smuggle some type of illegal cargo, it is never stated what that cargo actually was. Then again, it doesn’t even matter what it was, all that matters is that it belonged to the Hutt. Jabba’s unwillingness to let even his best smuggler get away with this one act is all it takes to establish Jabba as an unforgiving mob boss, and the underworld as a ruthless and dangerous place to inhabit. In turn, this underworld is symbolically represented in Return of the Jedi by Jabba’s palace on Tatooine. A dark, dimly lit place with strange sounds and vicious creatures, one must literally descend into the palace depths to have an audience with the Hutt. Upon entering the throne room, one finds the Hutt reclined and smoking hookah, a Sultan enjoying his opulent lifestyle as Baroque-style music plays in the background. With his majordomo Bib Fortuna at his side, and surrounded by a court of henchmen, bounty hunters, slaves, droids, and loyal subjects, there is no doubt that Jabba is the King of the this criminal underworld. Jabba the Hutt sits on his throne and smokes hookah. Of course, this underworld has since grown larger than it was in the Original Trilogy – thanks in large part to the Expanded Universe – becoming a realm inhabited by an endless line-up of other Hutts, small time criminals, marauding pirates, bounty hunters, and other villainous beings. There are crime organizations of all types – syndicates, death gangs, cartels, shadow armies – some having power and influence similar to Jabba and the Hutt Clan. A number of these organizations have also gained prodigious popularity among Star Wars fans (Black Sun, Kanjiklub, Death Watch), while certain criminals/gang leaders have become equally popular (Prince Xizor, Hondo Ohnaka). Plus, I would be remiss if I didn’t mention that one bounty hunter has also received god-like status among fans (Boba Fett), while another is closing in on divinity (Cad Bane). Yet, at the end of the day, all of these individuals and organizations, even those that I absolutely love with an intense passion, just cannot compare to Jabba the Hutt. Jabba will always be the the Don Corleone, the original gangster of Star Wars, a figure whose iconic stature towers over all other underworld characters. However, this shouldn’t be taken to mean that Jabba’s influence within Star Wars cannot be surpassed by another, especially following his death in Return of the Jedi. The thing is, in my mind there is really only one character who could effectively replace the King of the underworld, who could rebuild his vast criminal empire and become a force equal to the late gangster – Jabba’s son, Rotta. But I’ll discuss him in another post. This is the first of MANY pieces I have coming on The Force Awakens. Those other posts will start digging into the content of the film, but for now, I wanted to think about The Force Awakens in relation to the Star Wars canon in general, and the other six live-action films specifically. Almost immediately after seeing The Force Awakens, one of the first questions I was asked about the film had nothing to do with anything that happens in it. Oh no, the question I got was very specific and not at all surprising – where would I rank The Force Awakens in relation to the other Star Wars films. Frankly, the question left me a little dumbfounded. I was, at this point, less than 12 hours removed from seeing the movie for the first time and had not fully digested what I had watched. I might be a die-hard Star Wars fan but after one viewing of the film there was just no reasonable way for me to rank The Force Awakens with the other films. So, I politely deflected the question and didn’t answer it. Yet, the question won’t leave me alone. It has popped up in a few other conversations I’ve had about The Force Awakens and I have seen some people post their own updated rankings of the Star Wars films on Facebook, Twitter, in articles, etc. Now, to be fair, none of this is surprising. Since a new movie has been added to the list of Star Wars films, it was only a matter of time before conversations started circulating about where The Force Awakens should be ranked in that list. I just didn’t anticipate getting the question immediately after seeing it for the first time, though the person who asked it certainly meant well (as do those who continue asking me). Here’s the funny thing, though – I don’t have a rank list of the Star Wars films. While The Empire Strikes Back has always been my favorite, I have never taken the time to analyze the others and come up with some definitive list for second, third, fourth, etc. In fact, while “Empire” is my favorite, it’s probably not the one I have even watched the most. I have seen all six films so many times that I have lost count, so I really just don’t know which one tops the viewing chart. Then again, that doesn’t matter. At this point, all six are so engrained in my brain that they are, quite frankly, part of who I am, part of my self-identity. But the more I have thought about ranking the films, the more various angles and questions began popping into my brain. Ahsoka Tano sits and talks with her Master, Anakin Skywalker, after the Battle of Christophsis. For starters, when I see fans ranking the films, I can’t help but ask: why aren’t they including The Clone Wars movie? Sure, it isn’t a live-action film, but it did premier in theaters in 2008. Plus, it introduced Star Wars fans to Ahsoka Tano, THE most popular character in the Star Wars canon who has never appeared in live-action form. All I’m saying is that if one is going to rank Star Wars films, don’t leave this one off the list just because it’s animated. In turn, this opens the door to a larger question: why not just rank The Force Awakens with ALL of the Star Wars canon? I’m talking movies, books, comics, video games, etc. Since the Expanded Universe was disbanded by Disney/Lucasfilm, everything going forward is on equal footing as being canonical and relevant. So I have to ask: Is The Force Awakens better than Christie Golden’s novel Dark Disciple, Claudia Gray’s young adult novel Lost Stars, or the Shattered Empire comic series? Perhaps one would rank Ryder Wyndham’s junior novel, Ezra’s Gamble, above The Force Awakens but below the Season 3 episode of The Clone Wars entitled “Witches of the Mist.” Or maybe someone enjoys The Force Awakens Visual Dictionary MORE than the movie itself and have decided to place it above the film in their list. That might seem counterintuitive to some but to that particular person the decision would make perfect sense. Realistically, of course, it is difficult to rank the entire Star Wars canon, even for someone like me who is, more often than not, submerged in the Star Wars universe in some way, shape, or form. While everything added to the canon has equal authority, how does one even begin to compare junior novels to the films, or comics to video games, and so on? There are certainly some stories that I have enjoyed more than others, and there are others that I am more critical of, feeling they fall flat for various reasons. And even if I were to rank the entire canon what would that accomplish? My canonical ranking would look different than someone else’s ranking, and I really have no interest in sitting here trying to argue that mine is the right one. But like I said, the vast majority of people aren’t like me or other die-hard Star Wars fans. For the average moviegoer, The Force Awaken is the newest installment of Star Wars, period. My uncle, for example, has seen all six previous live-action films in the theater, but he certainly didn’t go and see The Clone Wars movie, nor does he read any of the books, comics, etc. AND this takes me back to what I said earlier: I’m not surprised that The Force Awakens is being compared to/ranked with the other live-action Star Wars films. Most people only have the original six films as their points of reference, so I can’t really expect them to include The Clone Wars movie (among other things) in their rank list. Is it fair to place The Force Awakens (or Rogue One) higher in a rank list than any of the original Star Wars films? Now, I am purposefully using the word “original” here to refer to both trilogies for a very specific reason: Episodes I-VI are the films that Star Wars creator George Lucas wrote, the comprehensive story he wanted to tell. Those six films are, in every sense of the word, the original Star Wars stories. So, we can reframe the above question in a different way, coming at it from a slightly different angle: Can a new Star Wars movie like “The Force Awakens” (or Rogue One), a movie NOT written by George Lucas, be a better Star Wars story than Lucas told in the original films? Don’t presume, though, that I’m suggesting The Force Awakens is not worthy of carrying the banner of Star Wars. On the contrary, I personally enjoyed the film and believe it’s as much a part of Star Wars as Revenge of the Sith, A New Hope, Attack of the Clones, etc. Rather, what I’m asking is whether its possible that The Force Awakens – or Rogue One – is, a more compelling, a more complete, an all-around better Star Wars story than anything Lucas gave us? Really, I can’t decide this for you. Whether you’re a “rank list” kind of person or not, you’ll just have to figure it out and articulate the answer for yourself. In my last post, The Gamorrean Affair, I examined the scene in Return of the Jedi where Luke enters Jabba’s Palace and uses a Force Choke on a couple of Gamorrean Guards. What I argued in that piece was that Luke unequivocally uses the Dark Side when he chokes the Guards, an act that symbolically and literally ties him to his father, Darth Vader. You can go check out the entire post HERE and see everything I had to say about the incident. While I had plans to move onto a non-Luke topic after writing that piece, I haven’t been able to get Luke and his interactions with Jabba out of my head. But out of all of the comments and actions in those scenes, there was one moment in particular that really kept bugging me – at the end of the battle over the Great Pit of Carkoon, Luke blows up Jabba’s Sail Barge. Why has this been bothering me? Welllllll, because Luke makes the unilateral decision to kill everyone who is left on Jabba’s Sail Barge EVEN THOUGH some of those individuals pose zero threat to him and his friends. Now, this isn’t to say that no one left on the Sail Barge was a threat. In fact, we know that there were many loyal (or, at least, well-paid) followers of Jabba who were willing to fight on the Hutt’s behalf. But there were clearly individuals on the Sail Barge who were non-combatants like Saelt-Marae (aka Yak Face), and Max Rebo and his band. Did Rebo deserve to die just because he was playing music for Jabba ? Or Saelt-Marae just because he was willing to watch the execution of Luke, Han, and Chewie? I mean, we may not like their association with Jabba, but that is not reason for them to be killed. But the fact that they are killed leads me to ask a pretty straight-forward question: What possible justification did Luke have for blowing up the Sail Barge and killing everyone who was left on it? As it stands, what we have on our hands is a really weird ethical and moral dilemma that involves Luke killing a lot of beings which effectively makes him guilty of multiple cases of manslaughter (or rather man/alienslaughter). And, along those lines, there is really no way of exonerating Luke for this crime. Then again, why would he should be exonerated? Is the hero of the story free to act however he wishes, killing indiscriminately just so his friends are safe? Why yes, I suppose he was, but when he kicks the trigger of the deck cannon, he is not under attack or being threatened. And besides,there were also innocent lives present on the vessel. A fair point, Luke wasn’t traveling on the Barge and would have no way of knowing about those non-combatants. But I must ask – should we defend Luke’s actions by defending his ignorance? I would suggest that being unaware of all the present beings means that he should be even MORE cautious with his actions. Because Luke doesn’t know who else is on the Sail Barge is precisely why he should not have made the decision to blow up the craft. For all he knows, Jabba’s young son could have been on the vessel. Wrong. While we can applaud the fact that Luke rescues his friends, fighting to save them does not give him carte blanche to act however he wishes during the battle. His actions must be proportional and acceptable within the context of the fight. Plus, as a burgeoning Jedi, we should expect and anticipate Luke to be extra cautious with his decisions and actions. He should be aware not only of the possibility for innocent lives to be harmed, but must be cognizant of his own mental state, his emotions, his body, and his connection with the Force. However, awareness is not enough — Luke must also be in control of himself. And for him to have that control, he must rely on his connection with the Light Side of the Force. Luke must allow the Light to wash over him, calming his mind, his feelings, his body. If and when he must fight, he must do so within a state that ensures he will maintain a calm and peaceful disposition. Mindful of himself, Luke must act in a way that ensures innocent lives are protected and any enemies are dealt with using appropriate and reasonable means. But in the battle over the Great Pit of Carkoon, if Luke was so swept up in the fight, then he was not truly in control of his actions, he was not calm nor at peace. Ultimately, what this means is that he was not being guided by the Light Side of the Force. No, and for a very simple reason – if one’s actions are truly guided by the Light Side, those actions will not lead to the death of innocent beings. Nor will those actions include the indiscriminate killing of one’s enemies just because one has the means to do so. This is precisely what sets the Jedi apart from the Sith, the Light apart from the Dark. What I would suggest is that when Luke goes to rescue Han and the others from Jabba the Hutt, he has clearly not internalized the teachings he received from Yoda in The Empire Strikes Back. He might fancy himself a Jedi, but blowing up the Sail Barge is unnecessary and taking the lives of countless beings is a clear indication that he is not guided by the Light and is NOT a Jedi. As for being guided by the Dark Side, well, I will let you decide that one for yourself. Leave a comment and let me know what ya think. Recently, I have been following (and have chimed into) a running debate that has been taking place in the comment section of The Seduction of the Dark Side, a recent post from Guest Talker Michael Miller. On the one side, Miller has been defending his stance that at the beginning of Return of the Jedi, Luke Skywalker is wading into but is not yet fully immersed in the Dark Side when he goes to save Han Solo from Jabba the Hutt. On the other hand, Miller has been challenged by one commenter who argues that Luke’s actions against Jabba and his cronies, while perhaps not fully of the Light Side, are not of the Dark Side. And, to make the conversation even more exciting, Cameron Clark (from the Four Letter Nerd) decided to jump into things as well. Needless to say, this whole conversation makes me really happy because, well, what good is a Star Wars blog called The Imperial Talker if people aren’t, ya know, talking about Star Wars??? 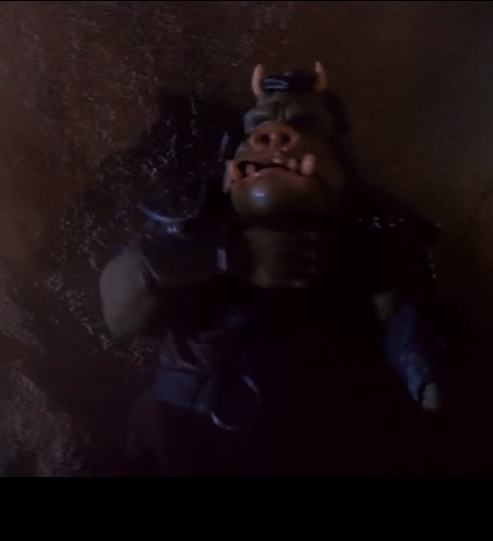 A Gamorrean attempts to free himself from Luke’s stranglehold. A hooded and dressed-in-black Luke Skywalker confidently strolls into Jabba’s palace. As he moves deeper into the palace, he is confronted by two Gamorrean Guards who bar his way by standing in front of him, axes crossed. Stopping in front of them, an expressionless Luke raises his right hand and use the Force to choke the two Gamorreans whom we see put their hands to their necks in distress. Then, the scene moves onto a new one. In terms of pure, straight up symbolism, when Luke strolls into Jabba the Hutt’s palace, he is dressed like someone who would use the Dark Side. In fact, from a distance, the hooded figure could very well be mistaken for Lord Vader. Now, to say that Luke’s appearance is symbolic of the Dark Side is not to say that Luke has been consumed by the Dark Side. It is an important difference. But while he may not be consumed by the Dark Side, Luke does use the Dark Side when he Force chokes the Gamorrean Guards. Naturally, this is a bit of a shock because Luke is supposed to be the good guy, the character who doesn’t use the evil Dark Side of the Force. Yet, his first on-stage appearance in the film is the exact opposite of what we would expect from the hero. This warrants a deeper exploration and the best place to start is by making sure we are all on the same page about the the use of the Force to choke someone. The Force Choke is a Dark Side technique, plain and simple. The Star Wars Databank confirms this point but I hardly need the Databank to prove anything. All the proof rests with Darth Vader. In A New Hope, he chokes Admiral Motti (for a lack of faith). In The Empire Strikes Back, the Dark Lord chokes Admiral Ozzel (for his clumsiness and stupidity). Also in The Empire Strikes Back, Vader will Force choke Captain Needa (for losing the Millennium Falcon). 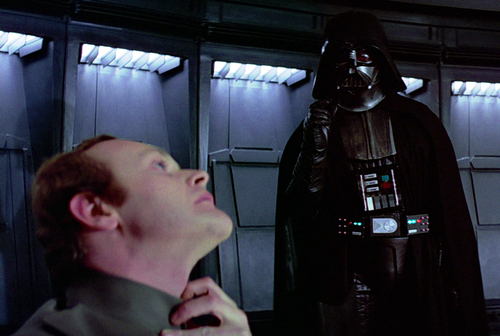 Vader uses the Force to choke Admiral Motti. When Vader Force chokes Admiral Motti, it is also the very first time in the ENTIRE Star Wars saga we see an individual utilize the mystical power of the mysterious Force. From the get go, it sets a very important tone for the saga about Vader and the Force: this menacing looking bad guy can use this strange power to kill you simply raising his (right) hand. On top of this, his use of the Force to choke Motti is also eye opening and shocking because at the beginning of A New Hope the first action we see Vader take is when he physically lifts a man by the throat and chokes him to death. This scene alone sets up Vader as powerful and terrifying, a cold blooded killer with incredible strength and power. The fact that he later engages in not just choking a subordinate, but does so by using the Force, elevates him to a frightening, supernatural level. Now consider this: from the beginning of A New Hope up to the moment with Captain Needa, we only ever see Vader use the Force three times and each time he uses it to do what? Choke someone. In other words, the Force Choke is established as the Dark Lord’s go-to technique with the Force, each time strangling a subordinate who has said or done something that displeases him. While a scene in Return of the Jedi would have been the fourth instance of Vader Force choking a subordinate, it was ultimately deleted from the final cut of the film. Instead, the last time we see the Force Choke utilized in the Original Trilogy is when Luke confronts the Gamorrean Guards. 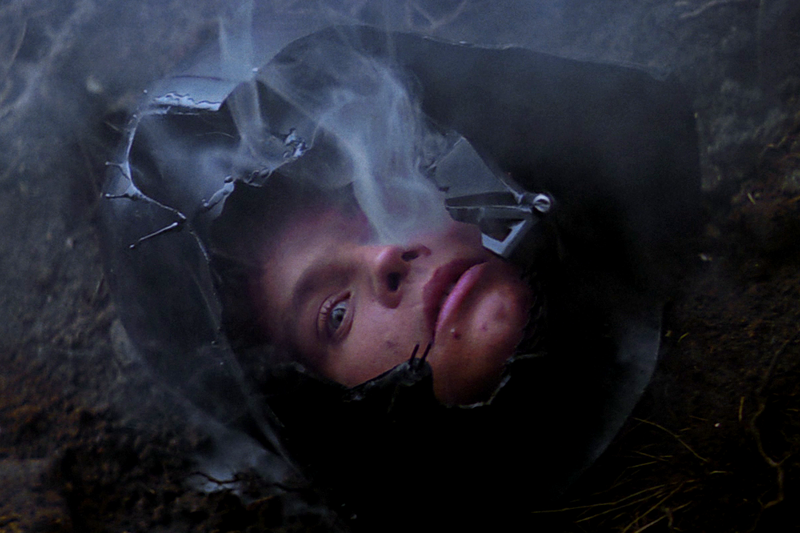 Luke’s face appears in the helmet of Darth Vader. When Luke heads into the tree cave on Dagobah in The Empire Strikes Back, he will end up being confronted by an illusion of Darth Vader. When he bests the illusion of Darth Vader by cutting off Vader’s head, Luke will see his own face appear in the Dark Lord’s helmet. The lesson is obvious: Luke could become Vader. And of course, this possibility is all the more profound when we later learn in the film that Vader is Luke’s father. The face in the helmet is not just an abstract lesson – if he is not careful, Luke could succumb to his own Dark Side potential and literally take his Father’s place. 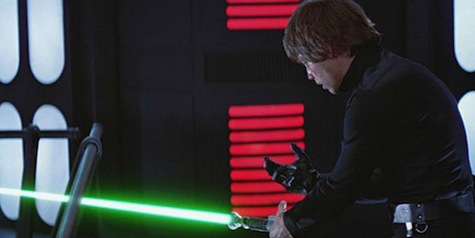 When Luke Force Chokes the Gamorreans, the abstract symbolism of the lesson collides with the reality of action. The act is not just symbolic of the Dark Side potential within Luke, it IS the Dark Side. There is no way to explain it away. The potential that exists within Luke to become Vader has now manifested and is on full display as he uses his Father’s go-to technique. In fact, Luke even raises his right hand to choke the Guards, mirroring Vader who also raised his right hand to choke Motti. This moment of mimesis goes deeper than a gesture with the hand, though. If we were to peel away the skin on Luke’s right hand, what would be revealed is not muscle and bone but wires and gadgets. It is his new, prosthetic hand, the one he received after he was maimed by Vader on Cloud City. Later in Return of the Jedi, the Force Ghost of Obi-Wan Kenobi will tell Luke, among other things, that Anakin (Vader) is “more machine now than man.” It seems only right that in calling upon the Dark Side of the Force to choke the Gamorreans, Luke would utilize the part of him that is machine, the part that physically ties him to Vader. Looking at his right hand, Luke realizes just how far along the path of the Dark Side he has journeyed. And tying him to Vader, literally and symbolically, is precisely the point. Luke may not be consumed by the Dark Side when he chokes the Guards, but he has begun to show his Darkness, starting down a path where he could, very well, become the new-Vader. It is no wonder that the trajectory of Luke’s journey in the film will take him from this moment to his showdown with his Father. At that point, on the new Death Star, the Son will not only face his Father, but will come to recognize his own Vader-esque Darkness. Only after going into a rage filled assault and defeating Vader will Luke understand the seductive draw of the Dark Side of the Force and his own potential to take his Father’s place by the Emperor’s side.